When we park our motorhome outside all closed up, my wife and daughter both complain about a smell that burns their eyes and stuffs them up. It has a rubber roof and a slideout. I have washed the roof a couple of times to see if that helps. It seems to be worse on hot days. Any insight into this would be very welcome. Thank you for your help. Alan, it is quite possible your wife and daughter are experiencing a case of formaldehyde irritation. Formaldehyde is often found in common products used during the manufacture of certain recreation vehicles. Because of its broad adhesive ability and high bonding qualities, formaldehyde is used in the production of pressed wood products, wallboard paneling, and possibly in some furniture and cabinet components. 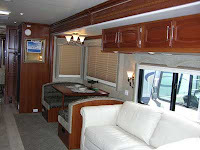 It can surely be a perplexing problem and a definite hindrance while trying to enjoy the RV lifestyle. Simply masking the odor with air fresheners or letting the coach "air out" will not usually eliminate the problem. There has been a rash of recent formaldehyde news of late. The following steps (as provided by an RV manufacturer), will neutralize the effects of the formaldehyde contamination you are experiencing. Be sure to take the necessary precautions while performing the following procedures. 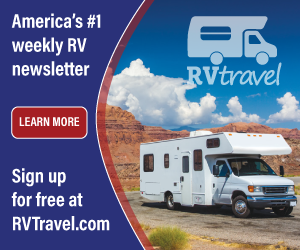 It may be advisable to take your motorhome to a reputable RV service facility and have them perform these steps if your eyes and throat are easily irritated. The procedures outlined here involve the use of aqueous ammonia, more commonly known as ammonium hydroxide. This ammonia, while it will eliminate the formaldehyde problem, contains strong irritants that also affect your eyes, nose, and throat during the fumigation process. If you choose to do it yourself, be sure to wear a protective mask, eye protection and gloves while handling the ammonia. Also be sure to read the first aid instructions that come printed on the ammonia container. You will need approximately one gallon of ammonia. First, remove all plants, fish, animals, foodstuffs, etc., from the RV. I would also empty all the drawers, remove bedding and all cooking utensils just to be extra careful. Remove all the drawers and open all the cupboards and closet doors. You’ll want the ammonia to evaporate into all areas of the RV. Disconnect the motorhome from shore power, but leave the batteries connected. Turn off the LP at the container. Drain the fresh water tank. Turn the furnace thermostat all the way up so that the furnace fan runs continuously. There will be no heat since the LP container is closed, but the circulating air will aid in moving the ammonia to all areas of the RV. Make sure all furnace ducts are clear and open. Close all the exterior windows and roof vents tightly. Pour one-half gallon of the ammonia into two wide, but shallow plastic bowls. Be sure to wear the appropriate safety protection. Place the bowls on a flattened plastic garbage bag in each of the two areas of the coach. Allow the ammonia to stand and evaporate naturally for a minimum of 24-hours, then open all the windows, doors and vents to rid the coach of any residual ammonia smell. The remaining liquid in the plastic bowls can be safely poured down the sewer drain, since it is comprised mostly of water at this point. Refill the fresh water tank, reinstall all the drawers and stow your belongings. There should be no residual formaldehyde present after this fumigation process and subsequent venting of the RV. It may be necessary, however, to daily vent the coach for a week or so to completely rid the RV of any leftover ammonia smell. This should effectively solve your problem.